For the families and caregivers of a loved one with dementia, there are many things to consider when it comes to making sure they’re safe. Are they taking their medication? Are they eating properly? Should they still be driving? Should they live alone? But a less-discussed safety issue is what to do if there are firearms in your home. Americans own firearms for various reasons: protection, hunting, sport/target shooting, as part of their profession. Nearly 33 percent of adults ages 65 and older own a gun, and another 12 percent live in a household with a gun. With the number of seniors with dementia projected to increase dramatically in the upcoming years, it’s important to discuss the steps you can take to keep you and your loved one safe. As dementia progresses, you may notice your loved one no longer acts as they once did. Behavioral changes are a common occurrence with cognitive impairment. As the brain changes both physically and chemically, any day can be the beginning of a new normal. It’s important to remember that your loved one could wake up completely unfamiliar with their surroundings, and maybe not sure of who you are. This confusion can cause fear, anxiety, and distrust—reactions that don’t mix well with firearms. Taking anything away from a senior with or without dementia can represent the loss of independence. In a recent article from NPR, Joleen Sussman, a psychologist specializing in dementia, suggests using the word “retire” when discussing eliminating an object from the home or an activity like driving. The idea of retiring something is less degrading than taking it away and can open the door to further conversation. Who would you like to tell you “it’s time”? Who do you want to give your guns to? Adding extra security measures to the home will also help combat any surprises. Making sure the guns in the house are properly stored and keeping the keys or combinations for locking devices away from anyone who shouldn’t have access to them (this also includes kids/grandkids!) is a good start. Keeping ammunition stored away from the firearm will also help eliminate accidents. If your loved one feels safer with the gun accessible and refuses to give it up, having it permanently disabled is another possibility. Legally, there are few options for families to have firearms removed from the home of a loved one with dementia. Most states do allow temporary transfers of firearms to a family member without background checks, but seven states don’t (Connecticut, Hawaii, Massachusetts, Michigan, New Jersey, North Carolina and Rhode Island). Thirteen states have passed “red flag” laws which allows police or family members to petition a state court to order the temporary removal of firearms from someone who may be a danger to themselves or others, and to keep your family from a dementia and firearm tragedy. 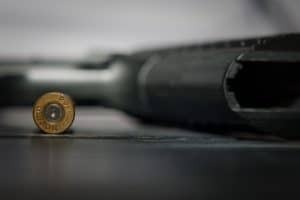 These laws are highly politicized, but may be helpful in assisting physicians and families in removing firearms from those with rapidly advancing cognitive impairment. While there is no perfect resolution to this issue, taking the proper precautions can help you feel safe, or feel confident in your loved one’s safety. If you’re concerned your loved one is no longer safe at home, it might be time to look into memory care options. Full-time care staff will be able to monitor their health and safety properly, giving you peace of mind.